I'm far behind on blog posts. I'm about to leave the country for three months, and I have not yet shared my favorite photos from my last overseas trip. It is time for some serious catching up! This is the first of three photo journal posts from my trip to India. 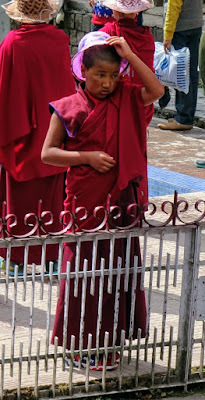 Last spring I traveled to McLeod Ganj. Situated in northern India, at the base of the Himalayan Mountains, the town is the home of the exiled Tibetan people. In McLeod Ganj, I had a Meeting with the Dalai Lama and Volunteered with the Tibetan Refugees. Below are my favorite photos from McLeod. The Dalai Lama's Temple is just one facet of the much larger complex known as "Tsuglagkhang." In addition to the main temple, the complex also includes the Dalai Lama's residence, the Namgyal Gompa, the Tibetan Museum, and the heart-breaking wall displaying the photographs of those who have self-immolated over the years in protest of Tibet's freedom. Tsuglagkhang is a pilgrimage destination for Tibetans and followers of the Dalai Lama. Around the circumference of Tsuglagkhang is a walk known as the "Kora Circuit." I had the great pleasure of walking the Kora a number of times. ...and trimmed with colorful prayer flags. Hubba, hubba! I love all the colors! Not all sentient beings recognize the Kora as a contemplative walk. Here, two monkeys bicker mid-path. One day, I spotted these two sentient beings along the Kora. and this juxtaposition of cat and monkey caught me off-guard. to sharing their outdoor space with monkeys. there were a number of wild dogs. hundreds of which lined the Kora Circuit. which looked as though it had been dipped in a can of black paint. I loved watching this colorful Tibetan woman turn the prayer wheels. ...and that is a lot of prayers! On one round around the Kora, I saw two Tibetans rolling up long stretches of cloth. Each cloth was printed with hundreds of prayers. These are the rolls of prayers contained within the prayer wheels. Rolls of prayers, waiting to be homed in wheels and spun by do-gooders. 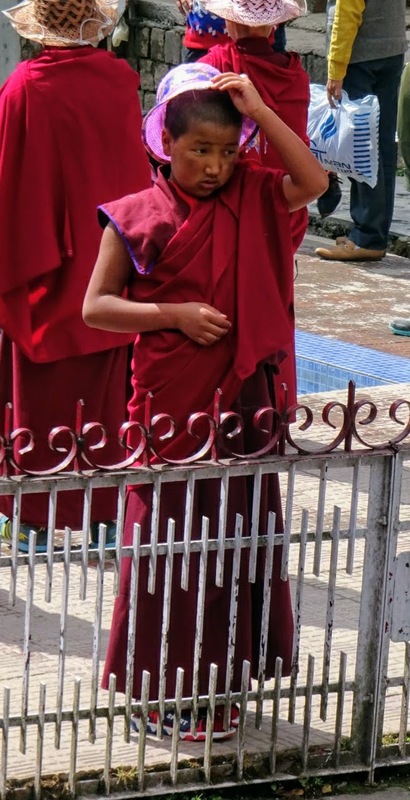 I loved seeing this hip monk, with his Apple AirPods extending from his ears. What do you imagine he was listening to? On afternoons, monks gathered outside the Namgyal Gompa to debate one another. After arguing each point, the monks clapped their hands and stomped their feet. It was quite the spectacle. I loved being around the Tibetans. Despite their predicament, they are positive and forward-looking. It greatly saddens me that the Tibetans have been driven from their homeland. Their exile is slowly loosening their grasp on their culture, and that is a loss for all of the world. Moments after settling into McLeod Ganj, I spotted this scene. it was confirmation that this is where I belonged. On my way to the Bhagsunag Waterfall, I looked down towards the Souli Khad. and spreading them on the rocks to dry. I've always considered monks' robes to be an extension of their skin. How humbling to see monks washing their robes. were all wearing colorful sun hats. Young boys in my culture wouldn't be caught dead in these hats. from prayer flags to "Free Tibet" stickers. two Tibetans with whom I became very close. in the same neck of the woods where I grew up. though they likely won't be able to meet him in-person for many years. 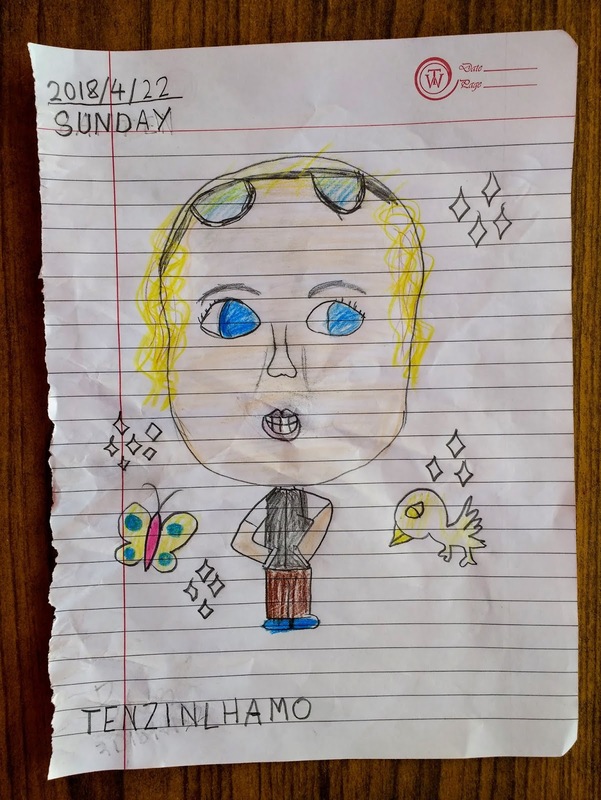 An adorable Tibetan girl named Tenzin Lhamo drew this picture of me. 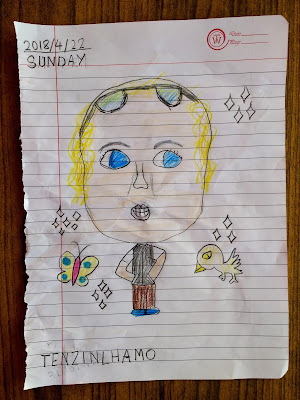 and my blonde hair held back by the sunglasses perched atop my head. 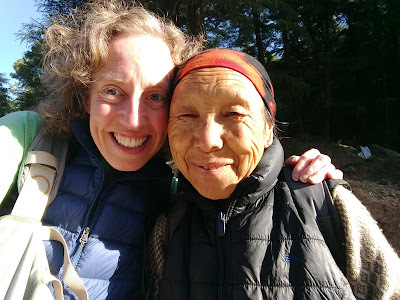 this lovely Tibetan woman stopped me in my path and held her hands to my face. her radiant smile and her warm touch relayed compassion.